As defined by Ochberg, a critical incident is “a relatively brief occurrence involving injury, loss, conflict, discovery or change of significant proportion, usually unscripted and unanticipated, with the potential to alter existing societal norms. Critical incidents are usually traumatic, threatening the bonds of trust that bind communities, but may be positive, initiating historic consequents” (See Academy for Critical Incident Analysis). Agent Based Modeling (ABM) is commonly used to model critical incidents at the threat level, specifically the interaction between the threat and the target. Tactics of interveners (first responders) are only beginning to be incorporated into these models. This paper will demonstrate some current examples of how ABM is used to model threat-target interactions. It will then present a simple prototype ABM of a critical incident event and a possible tactical intervention will then be demonstrated. A framework for the development of a larger strategic model is also discussed. Most current models of critical incidents only define the threat and the target; they do not take into account the tactics of interveners (first responders). Some examples of these models are provided in this paper. A diagram of a typical critical incident event as presented by Goodman is shown in Figure 1. It clearly identifies the threat and the target, but also shows a line pointing across the lower portion of the figure labeled “tactics,” which is representative of the tactics of the interveners. This paper makes the case that the violators, threat, and target, as well as the tactics of the interveners can be well represented in Agent Based Models (ABM). 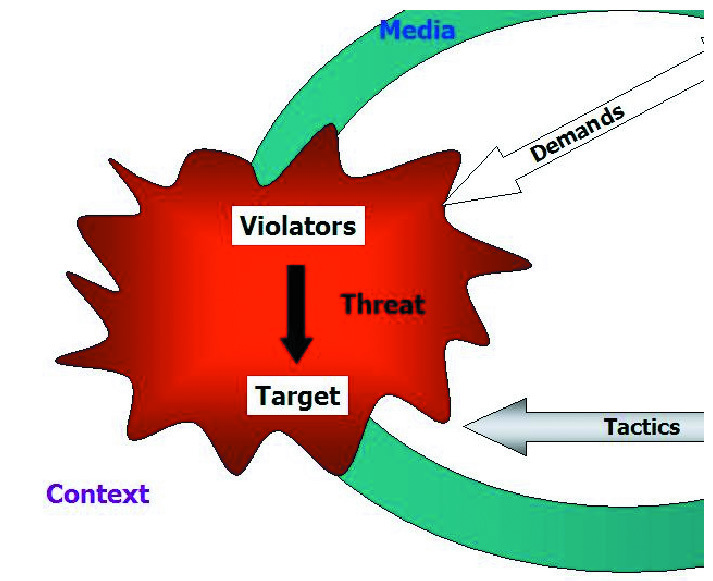 It is believed by the author that ultimately the actions of the media and the demands of the government, which are also shown in the figure, can ultimately be modeled using ABM as well; however, this paper will concentrate on the modeling of the violators, threat, target and ultimately the tactics of the interveners. Possible longer-term implications of the presence of the interveners, how that may be modeled, and general data needs are also discussed. “Agents are the people of artificial societies,” according to Epstein and Axtell (1996). Agents can also be developed to represent a threat. Batty (2005) describes an agent as having the properties shown in Table 1. He states that a central feature of agents is their ability to communicate. This enables them to interact with each other as well as to sense and respond to their environment. Agents can be used to represent different classes of individual, such as violators, evacuees (the target) as well as emergency personnel (interveners). Each agent is autonomous. The properties described imply that an agent will be able to react to changes in its environment. One of their goals will be to try to preserve themselves over the course of the critical incident, but they will likely have others as well. The critical incident process will happen over a period of time and the ability of the agents to respond will also have to occur over the same period. Agent behavior may be based on assumed previous experience. It may be assumed that the agent has prior knowledge or perhaps knowledge obtained during the critical incident being modeled. The agents will have to be mobile, have a degree of flexibility in dealing with their surroundings and may be forced to make decisions based on their emotional state. The underlying information used in model development consists of assumptions made concerning the properties of the agents. Quantitative aspects include the speed of movement of the agents in their domain, the number of different types of agents, the distance that they can “see” within their domain, etc. Qualitative aspects may include how the agents react to certain stimulus. ABM allows all of these characteristics to be programmed and changed, so a model can be developed iteratively. Why Agent Based Modeling of Interveners? Agent based modeling is appropriate for the development of a simulation of critical incidents and critical incident interveners for a variety of reasons. First, some necessary components of a critical incident model have traditionally been too complex to adequately model without radical simplification. For example, many evacuation models are based on hydraulic modeling of the movement of people, treating the flow of human beings as fluid, even though human movement is clearly more complex. ABM allows these more complex behaviors to be modeled. Second, critical incidents have interdependencies that ABM can make tractable. For example, in certain incidents the interaction of evacuees with interveners will need to be modeled. These interactions may radically influence the behavior of other groups. As the evacuees and the interveners can be treated as different agent types, even different individuals with different skill sets, the simulation of these types of interactions becomes possible. Third, data are becoming organized into databases of finer granularity. This data can directly inform the way the agents are programmed. Finally, computational power is advancing very rapidly and we can now compute large-scale micro simulation models that would not have been plausible just a few years ago (North & Macal, 2006). Once a model has been verified and validated, this computational power allows many other scenarios to be examined, and often times these scenarios would simply be too expensive, time consuming and dangerous to examine using any other method except simulation. Some hypothetical events that do not include interveners will be examined here. One is a study of a subway station evacuation (Till, 2006; Kang and Till, 2007) and another is the study of a hypothetical Stadium Bombing Incident (Redfish Group). A hypothetical model of a historic critical incident, the sinking of the Titanic, is also discussed. These application areas are discussed to demonstrate that ABM is used in present day threat analysis without incorporating the actions of interveners, and to explore the implication of this omission. Threats and targets are evaluated on an ongoing basis during the infrastructure design process. For example, fire in transit vehicles in underground stations and the subsequent evacuation of those stations are commonly modeled when new systems are designed. A National Fire Protection Association standard (NFPA 130) is frequently prescribed so that proper fire protection and evacuation facilities can be provided for new systems. 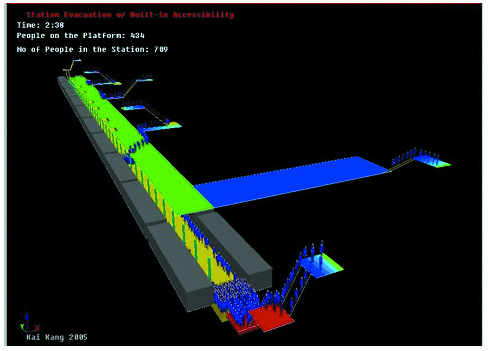 The standard requires that the results of an evacuation model are compared with results of a fire growth model that represents the heat and smoke threat of a subway train fire. In this way the threat to the target population is ascertained. Some of the evacuation models commonly used are agent based. These include Simulex (Simulex, 2010), Steps (Steps, 2010), as well as others. A graphic taken from a Steps model run is shown in Figure 2 (Kang and Till, 2007). Both Simulex and Steps are implemented in C/C++. Unfortunately the source code for both models mentioned is not available for review, and their output is ultimately compared to those of hydraulic models for engineering validation. Currently most models are validated by comparing their results to those of hand calculations that make use of the hydraulic models developed by Fruin (Fruin, 1971). Obtaining other data to validate station evacuation designs has proven to be difficult. Full-scale tests are difficult to perform for a variety of reasons including expense and the requirement that the systems operation be interrupted. The adoption of security cameras in many stations allows video to be collected that would help evacuation models to be validated. Obtaining this data is generally difficult due to security concerns. Usually the first four are grouped together as “response time” (Schadschneider et al., 2008). Currently NFPA 130 does not prescribe a specific “response time” for passenger movement, although it requires designers to account for this time in calculations. This is one area that would need to be further developed for a flexible critical incident model. Agents need to be programmed to make decisions based on their awareness of what is going on in their surroundings, and what their peers are doing. Agents not only need to make decisions about when they should move off the platform, but also if they should move through smoke or near a fire. This is also a fertile area for study. The counter flow and direction that would be caused by interveners arriving to extinguish the fire and care for the injured is currently not incorporated into these models. Recent work at NIST (Averill & Song, 2007) may make the counter flow modeling possible in the future. An agent based computer simulation model of mass egress from a stadium involving one or more attacks with Improvised Explosive Devices (IED’s) was developed (Samuelson et al., 2008) using the Processing development environment. Anti-IED countermeasures were also modeled. These included improved real-time information systems to provide better guidance to exits, baffles to absorb shrapnel, and allowing egress onto the playing field. The model assumes people are killed and injured in bomb blasts, which is to be expected. However, the model is unusual in that it has an algorithm that determines when evacuating agents might “panic” and might be “trampled” during the evacuation. Panic behavior is generally not expected in crowd disasters. A full evaluation of the assumption that trampling would occur in a stadium bombing is beyond the scope of this paper, but it should be noted: “Although a precise accepted definition of panic is missing, usually certain aspects are associated with this concept. Typically ‘panic’ is assumed to occur in situations where people compete for scarce or dwindling resources (e.g. safe space or access to an exit), which leads to selfish, asocial or even completely irrational behavior and contagion that affects large groups. A closer investigation of many crowd disasters has revealed that most of the above characteristics have played almost no role and most of the time have not been observed at all.” (Schadschneider et. al., 2008). Most post event research has shown that people tend to be reasonably calm, with many trying to help others (Tubbs & Meacham, 2007). The project has made their source code publicly available. This allows others to learn how it was implemented and can also help model verification, as other users will have the ability to look for logic errors in the software, and also to make their own modifications and test their own hypotheses. Validation data was available from an evacuation test of PNC Stadium in Pittsburgh, PA. This limited data was available to check the model rates of flow through passageways and choke points within the structure. The program developers traveled to PNC Park and studied its features extensively. They observed crowd movements before, during and after some events. They also corresponded with the chief of security for the facility. The ability to carry out ABM in a highly visual and interactive manner allows the modelers to communicate ideas and theory to the public. The program was originally implemented in NetLogo. However, due to the long run times necessary it was recoded into Java and Processing. Again, the direct action of interveners is not incorporated into this model. Interveners might care for the wounded, or try to pursue the violators. This would make the model more complex, but also more realistic. Implementing a model of the Titanic incident in an ABM would require the movement of beings in a “context,” just as in the other models previously described. In this case multiple grid areas representing the levels of the ship could be interconnected. The interconnections would represent stairs. As the lower decks flooded, the agents could be programmed to try to move to the upper decks based on whatever means were open to them. Clearly the rate of leakage would influence how fast the decks were flooded. Assumptions about leakage could be based on a “what if” analysis. For example – “what if the bulkheads were closer so that the ships compartments were smaller,” ”what if the bulkheads extended higher so that each compartment could not overflow into the next one,” etc. Regulations influencing the bulkhead height and size were both investigated after the disaster. Changes in ship design standards were one of the long-term policy changes after the disaster. How would the passengers behave if a bomb caused the damage and not an iceberg? Would modifications to the ships design mitigate what their response might be? Many of the issues involving mass evacuation, particularly subway station evacuation, are similar to those found on ships. Having to work against gravity forces passengers to exert themselves more than they would in a high raise evacuation. Most current data has been collected with passengers moving downstairs, making models such as this one more difficult to develop. The development of smoke as a threat in this type of model is similar to the flooding that may occur on board a ship. Both will inhibit passenger movement, possibly to the point where they must change direction and/or be trapped. All these steps may involve the action of interveners that may be sacrificing their own time for evacuation so that others may escape. A ship evacuation model has been developed by Galea (Galea, 2001). The model is very similar to more “standard” evacuation models (Simulex, Steps, etc. ), with the addition of elements 6, 7 and 8. Unfortunately the source code for this model is unavailable, so the exact implementation of the last three steps is unknown. In the previous application areas that were described, the actions of interveners could clearly play an important role. A model of shooting incident was developed that does include the action of “interveners” or “first responders.” In a recent public shooting incident the violator was an armed student targeting other students who fled or constructed barriers depending on their location, and this model attempts to replicate the situation simply. The model is based (with the program author’s permission) on a sample program provided on the NetLogo User Community Models website (Fink, 2006). In the initial version of the model, a group of citizens is randomly generated and placed within a grid space. Random obstacles have also been constructed within the space. The citizens have the ability to move throughout the space, but they cannot leave it. If they “see” a shooter (a specific figure representing a “violator”) they flee. Fleeing citizens are grey. The gunman is moving throughout the space, selecting citizens at random and wounding them. Wounded citizens become immobile and their color is changed to blue. The gunman, wounded students and violators are presented as larger figures, to make their location more clear on a printed page. As a pure threat-target model, without interveners, the model is trivial. In time all of the citizens will be wounded. However, when agents representing interveners are added to the model it becomes more interesting. This is shown in Figure 3. Red circles are used to represent the interveners. The interveners act to wound the violators in the same way that the violators seek out citizens. In this case when all the violators are wounded, the simulation ends. The number of interveners and their actions play a significant role as to the possible outcome. Theoretically the more interveners there are, the less wounded citizens there will be. There is a clear analogy between this model and the call for some politicians for more police on the streets (a framework for the inclusion of the politicians in an overall strategic model will be discussed later). Although not explored in this simple model, ABM offers the advantage that it allows the actions of the citizenry to also be changed. At some point they may all be “told” to take certain action via a wireless messaging system for example. What might happen if the gunman and his accomplices had this information too? These results could be examined if the model were developed further. An emerging issue in ABMs is the incorporation of GIS (Geographic Information Systems). In the case of a specific incident it may be possible to integrate a map of the area as the “context” that the agents are operating. All the critical incidents discussed here share the common issue of mass movement of the target population. Many computer programs have been developed to model this movement. Many use some form of ABM. There are currently over 45 evacuation models listed on http://www.evacmod.net. Most of these models are proprietary, and the extent to which they have been verified and validated varies. Some include relatively advanced human behavior, while others are relatively unsophisticated. In any case where the source is not available it is difficult to know with any certainty that the logic incorporated in the models has been implemented correctly. Developing a program using a common and freely available software architecture could help to establish a robust common basis for examination of evacuation during critical incidents that could ultimately be added to the overall strategic model. Making the source code available for the evaluation of all would increase confidence in any conclusions that were drawn using the software, making this portion of the critical incident model more robust. The output of most advanced computer models of mass human movement is usually compared to the results of hand calculations based on the work of John Fruin (Fruin, 1971). Fruin’s work has been recently criticized (by Fruin himself) because the data he used was collected in the late 1960’s. It is believed that pedestrians may travel at different speeds and densities based on a general increase in the rate of obesity since the 1960’s, however no data has been collected to verify these new assumptions. This lack of data needs to be remedied (Pauls, 2008) for a realistic model to be developed. In large-scale evacuations there is often limited egress width for evacuees to traverse. Any disabled individuals may also slow the overall flow. The influence of these phenomena also needs to be included in any model developed. Another area where further study is required is in the modeling of the interaction between the threat and the target. Many of the models that do incorporate both the threat and the target together are closed source and therefore also only subject to limited peer review. Mistakes and misconceptions are difficult to identify and discuss. To the author’s knowledge, no model takes into account the fatigue of the evacuees or the fatigue of the interveners. Some situations require extended evacuation times and possibly travel up stairs, such as in subway and ship evacuation. Data needs to be collected for these areas as well. The inclusion of interveners in the public shooting model raises a number of very interesting questions that could ultimately be explored with a larger scale longer-term strategic model of critical incidents. For example, how would one determine the optimal number of interveners? From a tactical level more interveners would provide better protection, however if the agents representing the target population had to make some kind of sacrifice for the protection provided as they would in the real world, how would that influence the outcome? Currently data on intervention is scarce. A relatively flexible model using discrete event simulation to model firefighting has been provided by Till (Till, 2001), however more data concerning task times and possible sequences for interveners is needed so that they may be incorporated into ABM’s. NIST work on counter flow issues between evacuees and firefighters is mentioned previously. At the inaugural meeting of the John Jay Academy for Critical Incident Analysis (ACIA) in January 2008, Erik Goodman presented a strategic framework for Critical Incident Analysis (Goodman, 2008). This paper emphasizes “the event”, shown in Figures 4 and 5 as the “red blob”, and in an enlarged version in Figure 1. 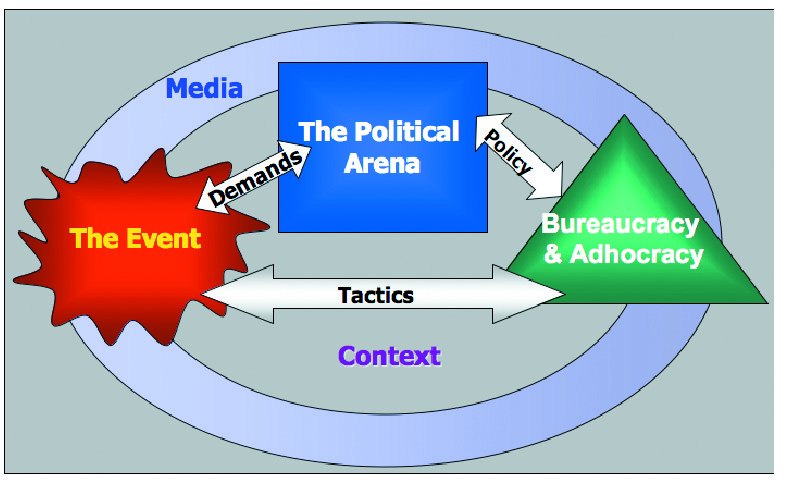 However as shown in Figure 4, Goodman established that any model of a critical incident would not only require the incorporation of the event itself, but also the demands it makes in the political arena, the influences of policy on the actions taken by the bureaucracy and adhocracy, and the resulting tactics that are fed back into the incident. 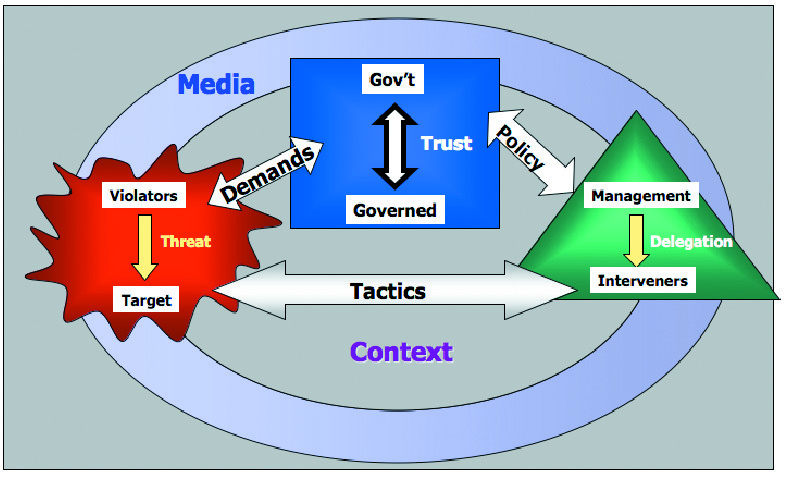 As shown in Figure 5, the political arena consists of interaction between the government and the governed based primarily on trust. The bureaucracy and adhocracy consists of management and whatever responsibility they delegate to the interveners. Within the framework, the media is shown to influence all other elements described. An ABM could be implemented that takes into account all of the interactions shown in Figure 5. This would be a true strategic ABM that took into account critical incidents and their influence over government, society and tactics over a long period of time. In other words, the influence of government could determine not only the number of interveners, but their specific tactics. Many other aspects of the “artificial society” would ultimately be developed as well. This paper represents therefore expands on only a small portion of the model proposed by Goodman, but a strategic model would have to be developed in pieces, and a more accurate model of mass human movement and the interaction between interveners and the target population would provide for both short term as well as longer term modeling needs. Four application areas are described. The first areas described make the case that threat, violators, and target are currently or can be being modeled using ABM. Sometimes the assumptions used were questionable, but open ABM models would allow them to be modified. The simple model developed makes the case that the actions of interveners can also be included using ABM and shows how their numbers may be incorporated into a model to possibly change its outcome. This paper makes the case that while a full critical incident model has not yet been implemented using ABM, progress has been made in the area of modeling the event itself, and ABM clearly makes it possible to model the actions of interveners. While in these early stages emphasis has been put on the event, ABM ultimately could and would have the ability to take into account government regime change and resulting policy changes, the influence of other critical incidents and other factors. In its early stages implementation of an overall strategic implementation of an ABM of critical incidents is unlikely to have predictive power. Its value will lie in its ability to examine some simple models and perhaps reveal where they are inadequate. As a more robust ABM is incrementally developed, it may be able to determine possible reasons for behavior. The model may have training value in its early stages, however similar to ABMs used in war games and simulation of economies. Frameworks such as NetLogo allow a model to be developed on a relatively small scale. Frameworks such as Repast (North & Macal, 2006) have been used to model much larger domains (Macal & North, 2005). Frameworks are currently being developed that would allow smaller models to scale up and run on supercomputers with thousands of nodes (Macal et al., 2008). The introduction of more agents with more advanced behaviors that this system would allow could produce better results. In order for such models to be developed a start must be made on the smaller scale as proposed here. Averill, J. D., & Song, W. (2007). Accounting for Emergency Response in Building Evacuation: Modeling Differential Egress Capacity Solutions. NISTIR 7425. Banks, J., Carson, J.S. & Nelson, B.L. (1999). Discrete-Event System Simulation. Upper Saddle River, New Jersey: Prentice Hall. Batty, M. (2005). Cities and Complexity, MIT Press, Cambridge, MA. Epstein, J.M. and Axtell A. (1996). Growing Artificial Societies: Social Sciences from the Bottom Up (MIT Press, Cambridge, MA). Epstein, J. M. (2007). Generative Social Science: Studies in Agent-Based Computational Modeling (Princeton Studies in Complexity). Princeton University Press. Galea, E. (2001). Predicting the Evacuation Performance of Passenger Ships Using Computer Simulation. In S. Grayson (Ed. ), Conference Proceedings – Interflam 2001 (pp. 853-864). London: Interscience Communications. Gimblett, H. R. (2002). 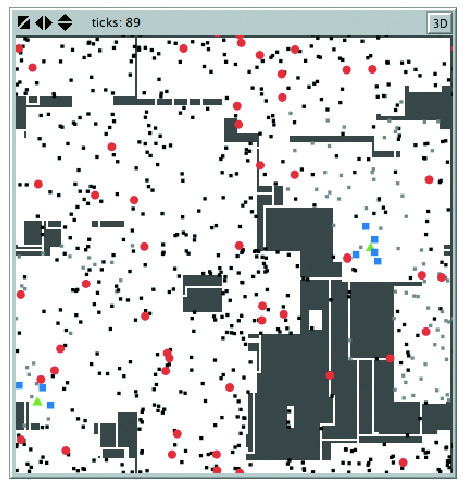 Integrating Geographic Information Systems and Agent-Based Modeling Techniques for Simulating Social and Ecological Processes (Santa Fe Institute Studies in the Sciences of Complexity). Oxford University Press, USA. Goodman, E. (2008, January). Towards an Agent Based Model of Critical Incident Analysis, presented at January 2008 ACIA Symposium, January 3, 2008. Heilbing et. al. (2000). Simulating Dynamical Features of Escape Panic, Nature, 407, 487-490. Kang, K., & Till, R. (2007, June). Underground rail station emergency evacuation – review of current code requirements. Presented at the NFPA World Safety Conference, Boston, MA. Electric Power Markets. Proceedings of the North American Association for Computational Social and Organizational Science (NAACSOS) Conference, Notre Dame, IN. Macal, C., North, M., Pieper, G., & Drugan, C. (2008). Agent-Based Modeling and Simulation for Exascale Computing. SciDAC Review http://www.scidacreview.org/0802/html/abms.html. NetLogo Users Manual Version 3.1.4 (2007). Retrieved 20 May 2007 from the Northwestern University web site: http://ccl.northwestern.edu/netlogo/docs/. National Fire Protection Association. (2003). Standard for Fixed Guideway Transit and Passenger Rail Systems, 2003 Edition (NFPA 130) Quincy, Mass: National Fire Protection Association. North, M. & Macal, C. (2006). Tutorial on Agent-Based Modeling and Simulation Part 2: How to Model with Agents. In L. F. Perrone, F. P. Wieland, J. Liu, B. G. Lawson, D. M. Nicol, and R. M. Fujimoto (Eds. ), Proceedings of the 2006 Wintersim Conference. North, M. & Macal, C. (2007). Managing Business Complexity: Discovering Strategic Solutions with Agent Based Modeling and Simulation (Oxford University Press, NY). Ochberg, F., Cinti, S., Goodman, E., Kirby, E., Melia, H., Prior, S., & Taggart, R. (2007). The critical incident model. PowerPoint presentation at the meeting for Critical Incident Analysis at John Jay College of Criminal Justice (CUNY), January 4, 2007. Pauls, J. (2008). Performance of Means of Egress Conducting the Research Needed to Establish Realistic Expectations Proceedings of 7th International Conference on Performance-Based Codes & Fire Safety Design Methods, Auckland, NZ, pp. 217-228.